In Part I of the conversation with Jason Falkner, Soraya & Jeff talk to him about his work with different bands, including The Three O'Clock, The Grays, and Jellyfish. Soraya & Jeff talk to drummer Troy Howell about his experience with the Salvation Army, Eyes of Mind, and the release of "Live From Torrance", a live Salvation Army vinyl-only release from Burger Records just in time for Record Store Day on April 13, 2019. Soraya & Jeff talk to Annette Zilinskas about making music and playing with The Bangs/Bangles, her other musical projects (Blood on the Saddle, Weather Bell, The Ringling Sisters, Medicine, 3 Hole Punch), her various artistic talents (including contributing a chapter to John Doe's new book and playing the "demonica"), an "Almost Famous"-esque plane ride, and her time with the baddest girl gang around, The She Devils. Soraya & Jeff talk to guitarist Derek See about his original music, and highlight his album THE GENTLE CYCLE. They also discuss his participation on the recently released "3x4" album, and his experience playing with bands like Rain Parade and The Chocolate Watchband. Soraya & Jeff have a conversation with reissue producer, writer and musician Pat Thomas. They talk with him about his various reissue projects, books and original music with Absolute Grey and Mushroom. Soraya & Jeff are joined on the podcast by The Long Ryders' bassist Tom Stevens to discuss their new album PSYCHEDELIC COUNTRY SOUL. We also talk to Tom about the band's reissues that he helped to curate, and end with a discussion about his solo material. Episode #19 Live Concert Review with Dean & Joy: Permanent Green Light Feb 10, 2019 @ The Federal Bar, L.A.
Soraya & Jeff are joined by friends Dean & Joy to discuss their love of Permanent Green Light and the live show experience from Feb 10, 2019 at The Federal Bar, Los Angeles, CA. Soraya & Jeff are joined on the podcast by The Long Ryders' drummer Greg Sowders to discuss their new album PSYCHEDELIC COUNTRY SOUL. On this episode we learn how the band ended up in Dr Dre's studio to lay down the tracks for their first studio album in 32 years! Soraya & Jeff are joined by Paisley Friends Joy & Dean talking about their initial opinions of the new Paisley Underground collaborative release on Yep Roc Records, 3x4. On this expanded version of the episode, we are joined by Yep Roc Project Manager, David Shaw, sharing some behind-the-scenes stories about putting this album together. Soraya & Jeff dive into The Bangles' full length debut ALL OVER THE PLACE track by track. Soraya & Jeff have a conversation with Danny Benair (and briefly with Michael Quercio), both of The Three O'Clock, about the recording of their 2nd full length album, ARRIVE WITHOUT TRAVELLING. On this episode, we learn about the label war following the band's full length debut, SIXTEEN TAMBOURINE. We dive into the album track by track talking about the writing and recording of each song. Soraya & Jeff play some of their favorite cover songs recorded by The Three O'Clock, Rain Parade, Bangles & The Dream Syndicate. In this episode, we play some demos, live versions and studio recordings of songs originally recorded by The Beatles, Buffalo Springfield, Paul Revere & The Raiders, The Easybeats, Bee Gees, Neil Young & Crazy Horse, The Grass Roots, and Fairport Convention. Soraya & Jeff talk to Steve Wynn about the new Paisley Underground release 3x4, STEVE SINGS BOB and The latest Dream Syndicate album, HOW DID I FIND MYSELF HERE? Soraya & Jeff wishing all listeners the happiest of holidays by playing holiday projects by all 4 Paisley Underground bands. At the end of the podcast we play a very special message compiled using brand new holiday greetings recorded late Nov/early Dec by our favorites. Enjoy and Merry Christmas! Soraya & Jeff talk about The Paisley Underground influence on megastar PRINCE and his influence on them. Soraya & Jeff discuss RAINY DAY, a compilation of cover songs recorded by members of The Paisley Underground. We play our favorites and discuss each track on the album. We briefly discuss the project with Three O'Clock frontman Michael Quercio to get his recollections of the recording of the album. Soraya & Jeff have a conversation with Rain Parade Guitarist/Singer/Songwriter Matt Piucci about the new 3x4 Paisley Underground project, and his experience with several post Rain Parade projects including his latest band, The Hellenes. Soraya & Jeff talk to Permanent Green Light members, Three O'Clock frontman Michael Quercio, guitarist Matt Devine & drummer Chris Bruckner about their new compilation HALLUCINATIONS. Soraya & Jeff conclude our conversation with Danny Benair. In part 2, Danny talks about his experiences with The Three O'Clock. Soraya & Jeff have a conversation with The Three O'Clock drummer Danny Benair about the new 3x4 Paisley Underground project, his experience at the free concert at Altamont in Dec 1969 and his history as a drummer with several notable bands. Soraya & Jeff were thrilled to talk with their first guest, Lina Litonjua, about her remembrances of the start of The Paisley Underground as well as her experiences with her bands, I.U.D. & Peer Group. Soraya & Jeff continue their discussion of their love for the 80's Los Angeles music movement known as the Paisley Underground focusing on the bands The Bangles & The Dream Syndicate. Soraya & Jeff discuss their love for the 80's Los Angeles music movement known as the Paisley Underground focusing on the bands The Three O'Clock & Rain Parade. 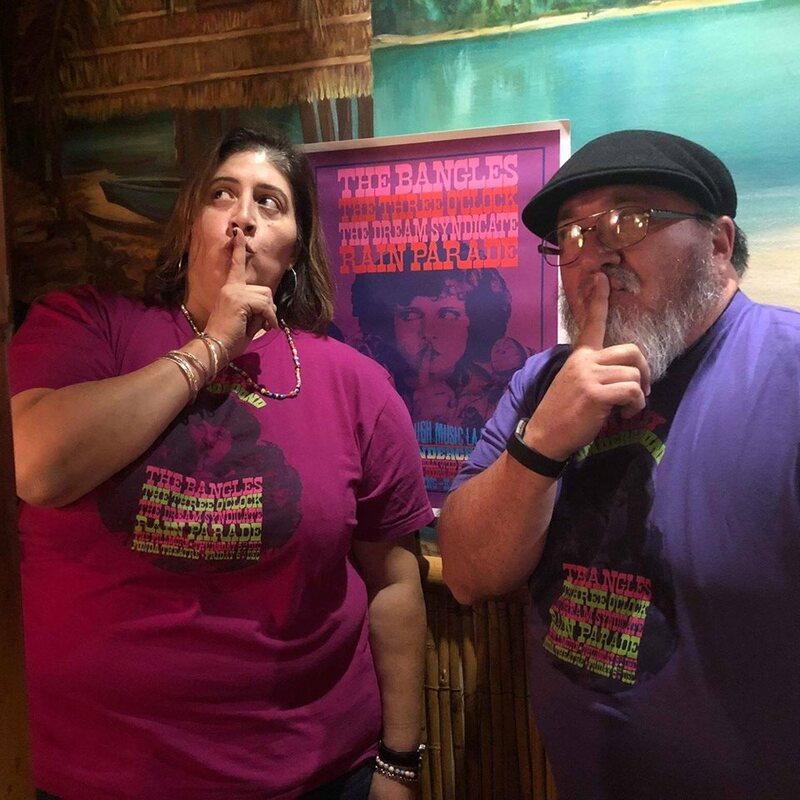 A Conversational podcast where Soraya & Jeff talk about their favorite music, namely the Paisley Underground movement that came out of Los Angeles in the early 80’s.